For those situations where bulk style gloves are used this new 2 bin dispenser is ideal for storage of gloves. 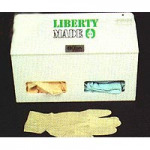 Made of 1/4″ acrylic the two bins hold hundreds of gloves for easy dispensing. 5″ deep.